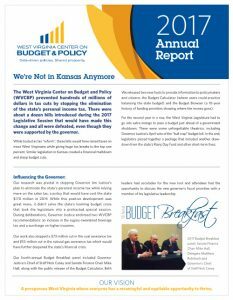 Founded in 2007, the West Virginia Center on Budget and Policy is a policy research organization that is nonpartisan, nonprofit, and statewide. The Center is thankful to receive funding from national and regional foundations as well as business and labor organizations. Please read our latest Annual Report for more information including a financial statement and list of funders. The Center participates in a national network of similar organizations in 42 other states as part of the State Priorities Partnership, sponsored by the Center on Budget and Policy Priorities, and the Economic Analysis and Research Network, an initiative of the Economic Policy Institute.